Ginger and I had another dinner and date night. Ginger had her dog food. I tried Rangoon Crab Cakes. Since I love Myanmar, I try anything that harkens back to that country, even though Rangoon has been changed to Yangon. Ginger and I had the last of our Ginger Gorg, which I got with my family while at a vineyard in Myanmar. 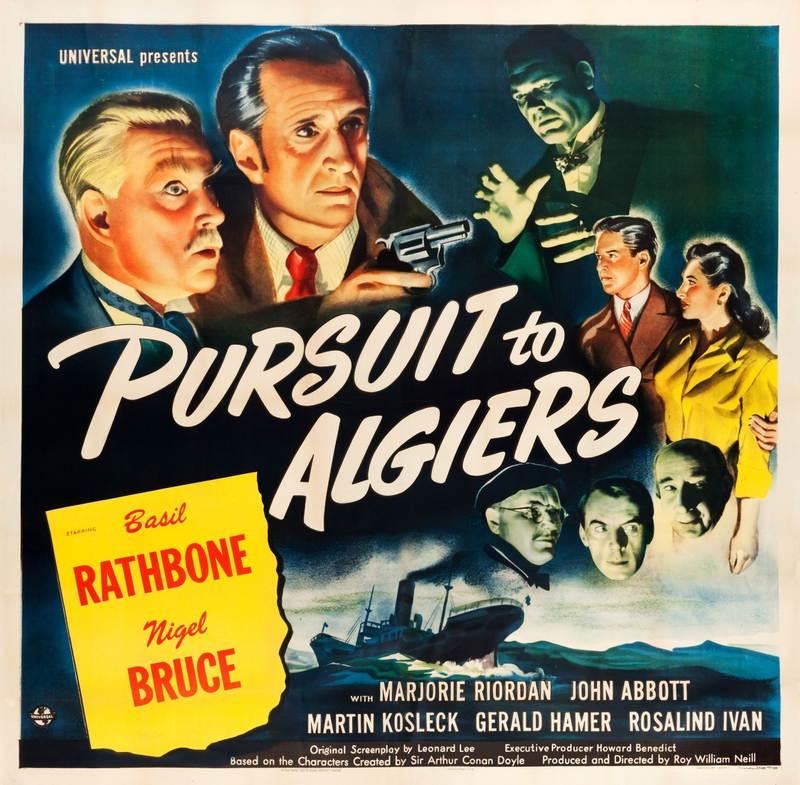 Then we sat back to enjoy another Sherlock Holmes film, "Pursuit to Algiers."" It wasn’t long before Ginger was questioning what was happening in the storyline. 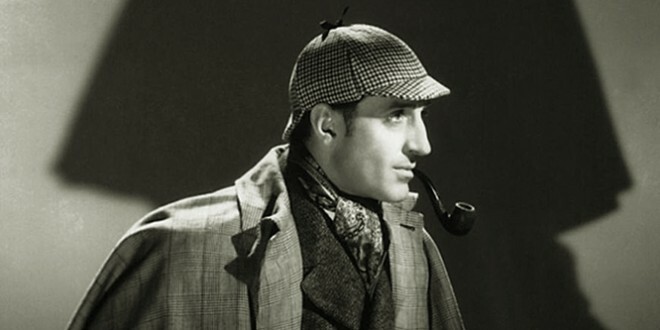 “I get that Sherlock Holmes and Dr. Watson are going to Scotland for a fishing vacation. However, their vacation was delayed by volunteering to return Prince Nikolas back to Rovinia. His father, the king, had just been assassinated. I agreed with Ginger that the separating of the two investigators did seem ominous. Ginger continued her confusion about the storyline of the movie. “Watson read a cable while on the ship about an airplane going down in the Pyrenees. I understand that Watson would assume that Holmes was killed. However, Holmes and the prince had been riding onboard the ship since setting sail from London. That surprised me. My only retort was that, while Holmes was smart, having Holmes killed would have resulted in ending the Sherlock Holmes series. Therefore, I had no fear of Holmes dying. I agreed that all the Sherlock Holmes movies required thinking outside the box. Then Ginger added her postscript to the movie. “There were two comments that I wanted to mention. Dr. Watson said, ‘Grouse, silly little birds, not worth the trouble of eating after you shoot them.’ Obviously, Watson isn’t an Irish Setter. Whenever I see any kind of bird, I will point until you say, ‘Go!’ If I caught a large bird like a Canadian Goose on the lake or a little robin, I’d like to eat them. With that comment, Ginger took her grog to near a large bone that I got her. 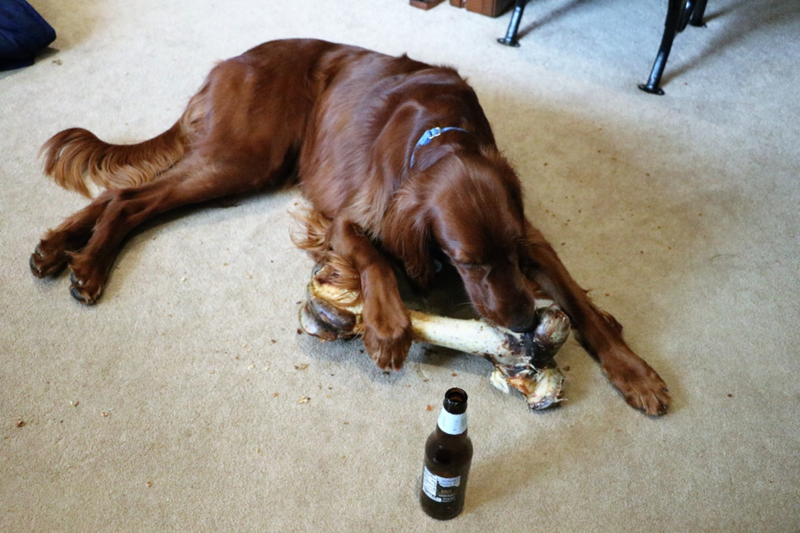 After finishing the bottle, she continued to chew on the bone. With Ginger’s final insight, we finished my grog, and we got ready for bed. This is a video of the Pursuit to Algiers.